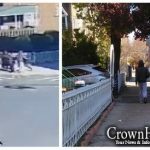 An emergency call involving Crown Heights Shomrim was caught on camera, when an angry man shoved an innocent passerby on Kingston Ave as another bystander filmed. 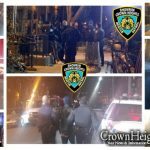 When a man, angry and violent, was seen walking up Kingston Ave Sunday evening, a concerned community member called Crown Heights Shomrim as he followed the man. Within moments, Shomrim volunteers were there to follow, as the man, described as a black male, made his way towards Eastern Parkway, angrily yelling at passersby. The man made it as far as Lincoln Pl and Kingston Ave before going into a corner store. He came out just a minute later still very angry. With Shomrim volunteers just a few steps away at all times, they followed as the man made his way back down Kingston Ave, waiting to see what he would do. As the man crossed over Carroll St, he approached an innocent passerby and violently shoved him to the side. The incident, caught on camera, shows the stunned man thrown across the sidewalk. The Shomrim volunteers immediately made their presents known. When he noticed that he was being followed, he laughed, and quickly mad his way down towards Empire Blvd. The Shomrim Volunteers tracked him to his building near Kingston Ave and Lefferts Blvd, where he entered using a personal key. 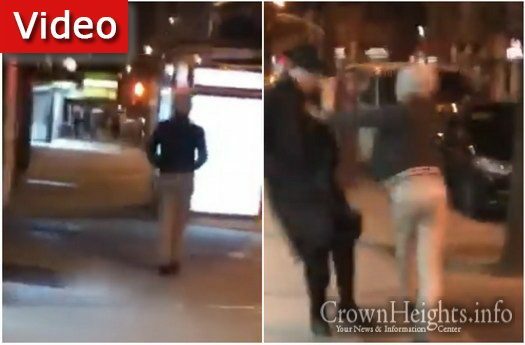 A Crown Heights Shomrim Coordinator clarified that the act of shoving another out of the way is not legally an assault, rather a charge of harassment. Therefore, the Shomrim volunteers continued to follow him. Another victim soon came forward claiming he was hit in the face as well as shoved by the man. This report is being investigated. This incident follows a string of unprovoked attacks on people in the Crown Heights area. Although not clearly linked, similar incidents have occurred recently, including one on Wednesday near Union St, and another near Lincoln Pl on Friday. 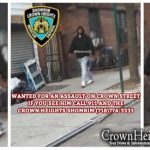 A Crown Heights Shomrim Coordinator has assured crownheights.info that they are working with the NYPD to catch the perpetrators of these crimes. “Stopping the man illegal” ??!! Sure, wait till he knocks someone down & they ch”v hit their head on tje ground. RIDICULES shomrim should have stopped him & held him for the police. If all you can do is “bleat” like a sheep, then all that will happen is that you will be attacked by the wolves (or “dogs”). How could it be that knocking someone to the ground isn’t a crime??? The current reality is that if a person pushes another person and there is no injury or bruises etc.. The police department will classify this as a harrassment. This is not classified as an assault. In no way shape or form does anyone think this behavior is normal or ok by any stretch. However Shomrim has guidelines of what it can do under the circumstances. This is why once he pushed someone we tightened the presence around him and followed him to his residence near lefferts and kingston. Meaning we eliminated his ability to push or attack anyone else. In the meantime now that his residence is known to us the information was shared with the police deaprtment. He is in fact wanted for a crime commited last week where he punched another community member on Union and Kingston. We are gathering additional information to connect the dots, working hand in hand with Police to close this case. While on this call we received another such similar call for a person acting disorderly… We responded immediately and were able to direct the police to the disorderly male and situation was resolved without incident. Shomrim is out there responding to all sorts of calls on a daily basis, and we remain commited to continue protecting and serving our community in the most efficient manner with Hashems help. We all want to see immediate results but sometimes the “long but short” way (see the fascinating story told in Gemara Eiruvin 53a and that is the basis to the Alter Rebbe’s approach in Tanya) will yield much better and long term results. Thank you very much for your extremely informative reply. I wish you tremendous Hatzlocho. You’re doing wonderful work.